After breakfast we will take a tour of Meknes including El Hdim square, Bab El Mansour, the massive gate which is the entrance to the old city and the Jewish quarter, the Royal Granaries & the city rampart. We will then depart via Volubilis, the Roman ruins and Moulay Idriss, the holy town. We will continue onto Fes. accommodation at a traditional riad includ breakfast. You will have a guided tour to discover the the medina and the famous Souks of Fes – its narrow cobbled streets are filled with ancient mosques and towering green-glazed minarets.. You will visit the most beautiful palaces and monuments of Fes. The tour will include a visit to the tannery and the ceramics cooperative to see the traditional moroccan crafts.overnight in riad includ breakfast . Morning stops at Midelt affording dramatic views of the High Atlas Mountains and modern, urban Er-Rachidia on your way to Rissani for afternoon check-in at your Kasbah Hotel (dinner & breakfast). After breakfast, we go to see the dunes and the oasis of MERZOUGA 2, nomadic lands, residents of KHAMLIA (blacks), MIFISS mines, desert plateau, nomads, Berbers, the oasis TISSARDMINE .. In the afternoon, stroll around the dunes camels to watch the sunset. Sleeping in the desert next to a beautiful oasis. Overnight bivouac (nomade tente). (dinner & breakfast). Merzouga to dades gorge via Todra Gorge and Tidra valley , Berber village . Transfer to dades via Todra Gorge,overnight dades gorge. Includ dinner & breakfast . After breakfast, the entire day is devoted to the visit of Ouarzazate: via rose valley , skoura , arrive to ouarzazate visite the cinema studio. 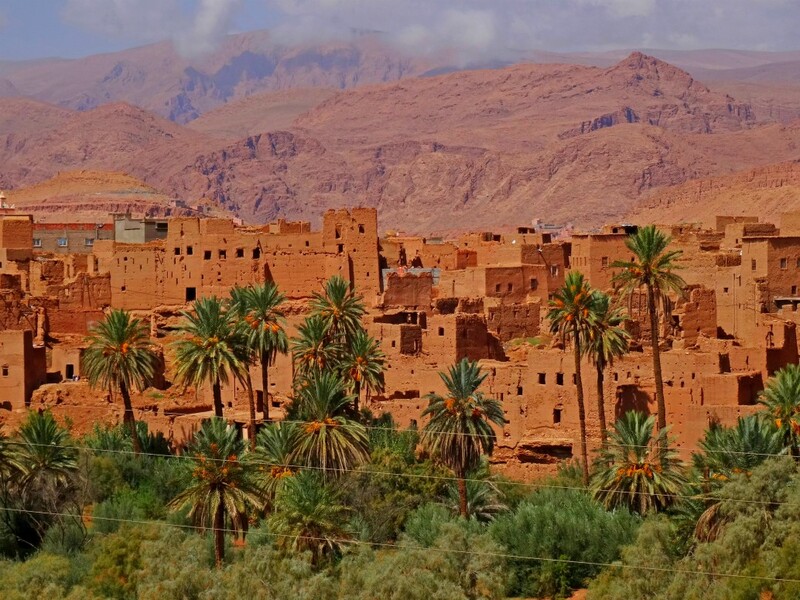 Then you will drive to the Kasbah of Ait Ben haddou (under Unesco protection) ; visit of the Kasbah and the old village afternoon departure to Marrakech via the Tizi-N-Ticha pass ; arrival to Marrakech , overnight in riad includ breakfast . As Marrakech is funny city , so you have will free day . Overnight in riad includ breakfast. This is a private one day trip from Marrakech to Essaouira, which will give you ample time to visit the important monuments, attractions and sights of Essaouira.. The Mogador exotic novels will enchant you with the beauty of its cool beach, its mild climate and bustle of its fishing port have the chance to taste fresh fish. Its UNESCO protected Medina is unique, and its artisans, specializing in marqueterie, will fascinate you with the finesse of their work. Marrakech to Essaouira excursion can be taken whenever you desire.overnight in hotel. After Luch Back To Marrakech.